I’ve been experimenting with the development environment of my Linux setup recently. I’m running two virtual machines via VMWare Workstation from my Windows 7 PC. One is an Ubuntu 10.10 install using the Gnome desktop, and the other is openSUSE 11.4 using the KDE Plasma desktop. I’m also using Vim – which I have to say, I’m liking a lot (my dotfiles and Vim settings, plugins etc. are here). I’m also trying to synchronise settings between each machine, ideally using the same terminal and font settings. On Linux this has been a challenge since Gnome and KDE handle fonts a little differently. Gnome has also made the Tango project and theme its default for the Gnome Terminal emulator. This is a great colour theme that softens system colours using a more ‘pastel’ palette. However in order to get this to work under KDE you need to download the following colorscheme. Save it as Tango.colorscheme and place it in your ~/.kde4/share/apps/konsole/ directory. It will then show up under the Settings –> Configure Profiles –> Appearance tab for Konsole. 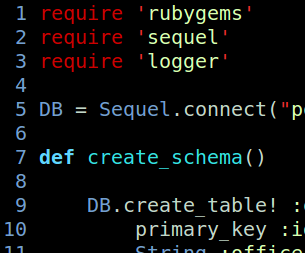 A matching terminal colour palette combined with my custom Vim colour scheme (daring-dark.vim) – and I was close to having matching systems. The trick was finding a matching font. Monaco was pretty good under Ubuntu – but it was broken under openSUSE (even the Linux version). And then I discovered Bitstream Vera Sans Mono via the Gnome project. A brilliant font and perfect rendering under Gnome Terminal, and Konsole. And so there it is. I still think Monaco looks just a tad better in Visual Studio – but Vera Sans Mono on Linux with the Tango colour theme, and my custom Vim colours – is gorgeous. You may also like this, it gives a colour prompt which turns green on an exit status of zero and red otherwise, great for running unit tests :) PS1="\[33[0;33m\][\! ]\`if [[ \$? = "0" ]]; then echo "\\[\33[32m\\]"; else echo "\\[\33[31m\\]"; fi\`[\u.\h: \`if [[ `pwd|wc -c|tr -d " "` > 18 ]]; then echo "\\W"; else echo "\\w"; fi\`]\$\[33[0m\] "; echo -ne "33]0;`hostname -s`:`pwd`07"
Terminator (which is an awesome cross-platform terminal emulator)????? I got lost!!! Thanks Carolos - I've updated the post.